Pick an object to draw. It should be something in your view, not something imaginary. Look at the object and select a point on the object where you want to begin your drawing. Place your pencil (or finger) to the screen ad let your eye trace the details of object. As your eye moves, move your hand. Do not lift your pencil, instead make a single continuous line that wanders around responding to the details your eyes stumble across. The urge will be almost irresistible to look back and forth from the object to the paper. This habit leads you to judge your drawing to quickly and breaks the link between your eye and your hand. That is why this app hides your drawing except for a faint line. After your eyes have touched all the edges, the contours of the object you are drawing, you are finished. Lift your pencil, tap the eye icon in the upper left and your drawing will appear. Now comes the hardest part of blind contour drawing. When you see your drawing for the first time there will be a voice in your head telling you it isn't good. Don't listen. It is perfect. 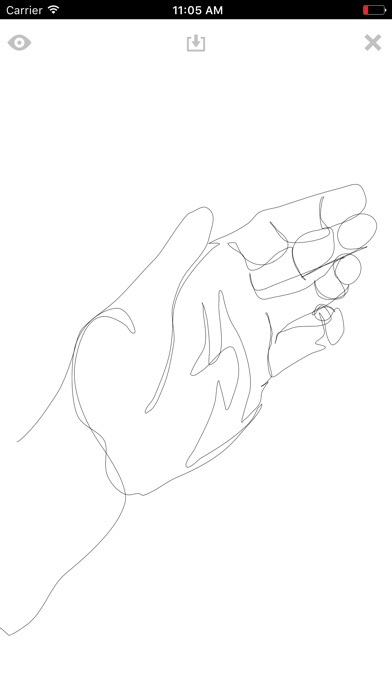 You are looking at a direct recording of your observation, the documentation of the connection between your eye and your hand. Finally, tap the save icon to save it to your camera roll then share it with friends. Then clear your canvas and try again.